In-flight Internet provider Gogo plans to boost access speeds after a legal spat with customer American Airlines over slow service. Gogo plans to add bandwidth in two stages, first by buying more capacity on geostationary satellites from Intelsat and, some time after 2018, adding links to a future low-earth-orbit satellite system being built by OneWeb. Unsatisfied with the speed of Gogo's existing service, customer American Airlines recently took the company to court in a dispute over whether their contract allowed American to switch to a different provider. The airline ultimately dropped the suit without prejudice when Gogo offered to submit a new bid, according to media reports. Gogo's planned service upgrade will give it the technology to make that bid. Over Intelsat's EpicNG satellites, due to enter service this year, Gogo will be able to deliver downlink speeds of up to 250 Mbps per aircraft, to be shared among all passengers, the company said Monday. OneWeb's planned satellite constellation should offer similar speeds, but with much lower latency because of the satellites' lower altitude, Gogo said. Geostationary satellites orbit at around 36,000 kilometers above the equator, with signals taking around a quarter of a second to make the trip from a plane up to the satellite and down to the ground station. OneWeb's satellites will orbit around 1,200 km above the earth's surface, with signals from the plane bouncing back to earth in around 10 milliseconds. OneWeb's satellites are still on the drawing board. It plans to launch of 648 of them starting in 2018. It takes so many to offer worldwide coverage as each satellite can only transmit to a small portion of the earth's surface as it whizzes overhead. In comparison, Intelsat offers near-global coverage with just 50 satellites. To make use of the OneWeb and EpicNG satellites, Gogo will need to deploy new terminals in its customers' aircraft. The terminals, which it calls 2Ku, have been in testing since late 2014. 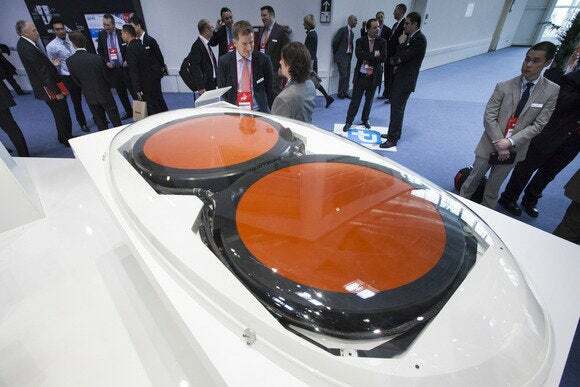 Initially Gogo expected to deliver connection speeds of just 70 Mbps per aircraft using the 2Ku terminals, but last month the company said it plans to roll out a new satellite modem capable of up to 400 Mbps.